The DC Tromb 400 is designed to meet modern safety requirements and to work in conjunction with tools that have become ever more efficient and that therefore produce more dust than they have previously.The maximum airflow is as high as 400 m3/h, which is more than enough capacity for equipment such as floor grinders with a working width of 500mm and large electric cut-off saws. “This is the most powerful single-phase machine that we have yet developed to meet the ever increasing requirements for dust removal. The demand from users for faster and more powerful tools and machinery means that these also produce a greater volume of dust. And of course, this is something that we have to address when we develop our products. We have therefore equipped the Tromb with a more efficient cyclone, a larger filter area and smarter filter cleaning. In addition to the user breathing cleaner air whilst working, any unnecessary downtime that may be caused by the dust is avoided,” says Anna-Lena Berg, CEO at Dustcontrol. 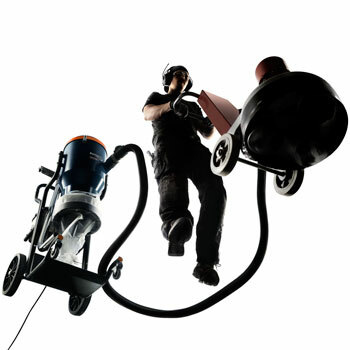 The DC Tromb 400 is designed for fine dust of various types, such as plaster and concrete as well as dust from construction and grinding operations, and it is powerful enough to be connected to grinding machines and hand tools such as cut-offs, jackhammers and saws. It comes equipped as standard with a rinsable fine filter and an H13 filter that complies with asbestos removal requirements. The compact design and puncture-proof, lockable wheels make it easy to handle and use, even in tight spaces and on uneven surfaces. The DC Tromb can be ordered with different collection options: 40-litre container, 20-litre plastic bag or with Longopac plastic bags. Delivery includes a 5-metre hose (Ø 50), a steel wand and a tough aluminium floor tool.